The Fairhaven district in Bellingham, Washington occupies the area around Bellingham Bay that was formerly one of four pioneer settlements surrounding the bay. The original plat of Fairhaven was filed on January 2, 1883, by Daniel J. Harris, the "Dirty Dan” Harris of local lore and legend. He named this area Fair Haven from the native "see-see-lich-em”, meaning "safe port” or "quiet place”. Dirty Dan was only one of the many colorful characters that comprise the rich fabric of Fairhaven. 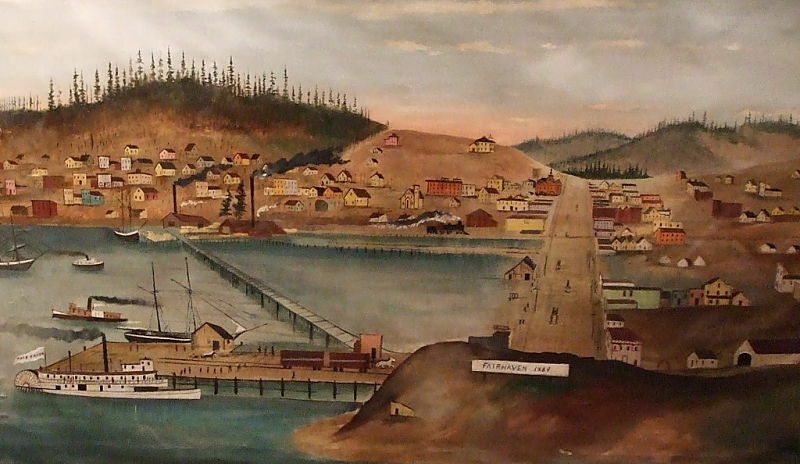 Beginning in 1888, the town of Fairhaven on Bellingham Bay was experiencing a period of rapid growth and significant development due in large part to the efforts of promoters eagerly anticipating that Fairhaven would be selected as the western terminus of the Great Northern Railroad. These promoters, led by Nelson Bennett and joined by C.X. Larrabee, Edgar Cowgill, E.M. Wilson, Alexander McKenzie and J.J. Donovan formed the Fairhaven Land Company. They actively advertised opportunities in a land of rich natural resources, a mild climate and limitless possibilities for wealth and prosperity. Indeed, the population leaped from around 150 in 1889 to 8,000 in 1890 according to the Fairhaven Herald of December 29, 1890. Buildings were erected at a rapid pace during the boom years of 1890-1892, and then came to a halt with the onset of the big depression of 1893. After a period of slow growth beginning in 1900, followed by consolidation with the town of Whatcom in 1903, the town of Fairhaven became the "south side” of the city of Bellingham. In 1977, Fairhaven was designated a historic district on the National Register of Historic Places with 14 buildings of primary historical significance and 3 buildings of secondary significance. Click Photo above for more information on the 1889 painting.